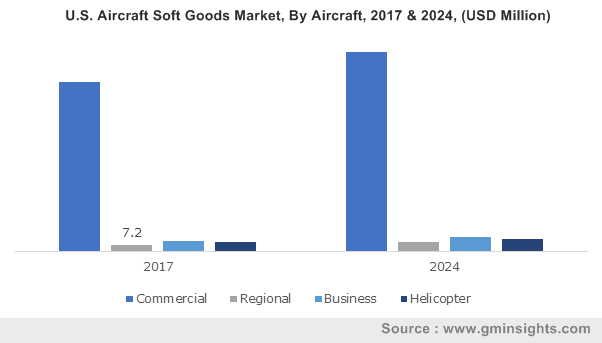 Aircraft soft goods market, of late has been witnessing commendable advancements, given the rapidly changing dynamics of the aviation industry. Aircraft interiors, despite being a part of mainstream aviation for years, has lately come into the limelight as its commercialization has taken a new direction. Thanks to the advancement in infrastructure and globalization trends, there has been a robust increase in the number of passengers travelling by domestic and international flights. If estimates are to be believed, the global airplane delivery surged from 1,714 to 1,740 in a time span of one year between 2016-2017 to cover the production backlog. In consequence, this has resulted in an increase in aircraft production, thereby stimulating the global aircraft soft goods industry growth. Enhancing overall customer experience has been another pivotal factor that has increased upholstery product usage such as curtains, carpets, and seat covers in the aircrafts. Refurbishment activities and cabin upgrades to ensure enhanced safety, aesthetics, and regulatory design standards have had a significant impact on the aircraft soft goods market demand. The replacement of conventional materials with advanced materials such as nylon fabric, synthetic leather, etc., for improving passenger comfort, surface texture, and overall cost effectiveness is further expected to drive substantial investment trends in R&D and product innovation of the overall aircraft soft goods industry. This is quite evident from the efforts put in by prominent market players. Hexcel, for instance in 2017, invested in expanding its Leicester plant and will be installing an advanced machine for the development of carbon non-crimp fabrics and lab equipment for research into this technology. It has also been reported that the company will be leveraging the expertise of National Composites Centre in part processing and material handling sectors. The firm, renowned for its advanced composites technologies is further seen investing into developing progressive & cost-effective materials and other manufacturing solutions for automotive and aerospace composites structures. Another recent instance validating the authenticity of the tremendous growth potential in aircraft soft goods industry is of the Ethiopian Airlines Group that has inked a partnership agreement with the German-based interiors supplier ACM Aerospace. The deal will see Ethiopian Airlines set up a new unit in Ethiopia to manufacture and supply a myriad range of interior aircraft parts for ACM, including safety belts, seat covers, curtains and carpets. Reports reveal that the facility will be operational within a few years’ time, however, until the processes are completed, it will primarily manufacture aircraft interiors using imported raw materials. Later, the partners intend for leathers & other fabrics produced in the region to be legitimate for use. If industry experts are to be believed, this partnership move is not only set to have a major impact on the regional growth of aircraft soft foods market but is also expected to boost the country’s leather manufacturing and textile industries. In a bid to work in tandem with the improving sustainability of the overall aviation industry, investors are strongly emphasizing on replacing composites with bio-based and recyclable materials. Speaking along similar lines, it is prudent to mention that the EU-funded researchers in their ECO-COMPASS project have recognized some potential recycled and bio-sourced materials from plants & carbon fibers that can be developed into environment-friendly composites for aircrafts. The team has also developed a bio-based resin system that has significant properties for a myriad range of aircraft applications. Sources familiar with the matter also reveal that the composite materials developed during this project are expected to be used in the form of interior paneling and in other secondary structures of the aircraft. Pertaining to these advancements in the sustainability trends, aircraft soft goods market is expected to witness an appreciable growth rate in the future. In fact, it wouldn’t be wrong to quote that the rapid progress in bio-based materials stands as a testimony to the unprecedented development of aircraft soft goods industry, which according to Global Market Insights, Inc., will surpass a valuation of USD 560 million by 2024.